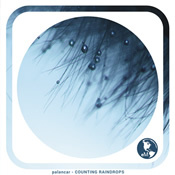 Palancar invites you to dwell in a state of quiet contemplation and “reminiscent reflection” on his latest drone-based release, Counting Raindrops. That being said, there are different kinds of contemplation and reflection, but don’t worry–Palancar (aka Darrell Burgan) will walk you through them over the course of an hour. You can go very, very deep inside yourself in the misty whispers of “Headwaters.” This is Counting Raindrops at its quietest point, gorgeously ethereal and soothing, yet kept in constant motion by small shifts of sound and detail. Here, a little sequencer line briefly cuts in a sense of beat; here, a strong pad rises up for a moment, just to fade back into the fog; here, the quiet patter of rain–or is that just a soft electronic crackle?–catches your attention. Perhaps your contemplation is a bit darker. Then you’ll be at home in “The Rain is Full of Ghosts Tonight,” with its crack of thunder, theremin-like wails and pall of a moonless night. Burgan leans on the intensity late in the track, building a big wall of aggressive sound that just–stops. Interesting choice. I admit to had to grow on me, but now I like it. “The Child Ephemeral” also churns its way into a grim rawness with edgy drones tearing into soft pads over and over. That should suit your sullen mood, too. On the other end, there’s the title track, washed in the sound of a light rain and finding its way to a quiet piano melody, the descant notes falling perfectly. This is the track I’ll be sitting on the porch with some evening, getting lost in thought. It’s the balance of ambient gentleness and more forceful, twilight-dark drones, that make this album work so well. That, and the great degree of detail, which has always been a Palancar hallmark. Sounds shift and roll, step forward and ease back, and it all creates a richer sense of dimension. His use of field recordings is nicely understated, with the exception of the drumming spatters that kick off the title track. They hit a bit hard, and pull me out of my reverie for a moment, but soon enough they become a quieter element in a bigger flow. The rain sounds at the end and beginning of the album create a simple dovetail for long looping, which really is the recommended mode of play for this release. The great backstory to this disc, by the way, is that it was submitted to the earthMantra label anonymously. Burgan is the original founder of the label, but he had stepped away from it. Geoff Small of Relaxed Machinery took up the mantle in 2014 and began releasing new material. Burgan didn’t want his album judged on the basis of who he was in relation to earthMantra, so he had someone else submit it “for a friend.” Small liked what he heard, gave it the yes, and was then thrilled to discover whose work it actually was. Something to contemplate as you enjoy your many listens to Counting Raindrops.